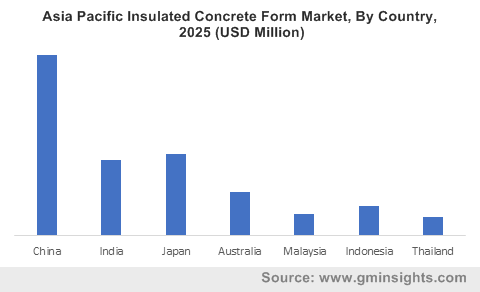 Global Insulated Concrete Form Market size was valued at over USD 1 billion in 2018 and is anticipated to witness a CAGR over 5.5% up to 2025. 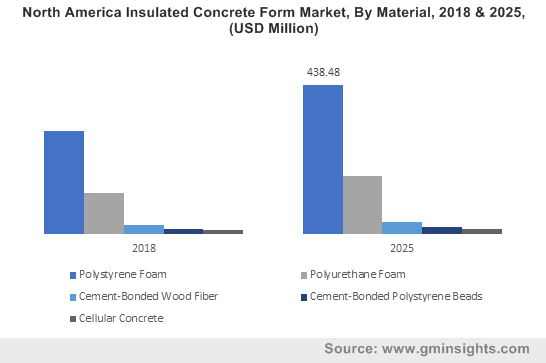 Rising demand for green & sustainable construction to minimize the carbon footprint, disaster resiliency, along with heating & cooling benefits in modern construction will propel the insulated concrete form market growth. Growing urbanization in the developing countries will provide a positive outlook for the building sector which will further enhance the industry landscape. ICF systems provide improved energy efficiency and greater structural strength, thus contributing to the increased acceptance from the residential, commercial, infrastructural, and industrial sectors. Continuous growth and prosperity of the ICF in the construction & infrastructural sector due to the technological superiority compared to the traditional wooden framed walls and roof system will promulgate the insulated concrete form market size. Growing concerns related to the reduction of carbon dioxide levels along with an increase in electricity costs will further increase the demand for the product, thus providing lucrative opportunities for the industry participants. Growing occurrences of natural disasters including tsunamis, hurricanes, floods, earthquakes, tornadoes, volcanic eruptions etc. will further lead to an increase in construction of disaster-resistant houses. Significant increase in the construction of disaster resistant buildings in the polar countries and disaster-prone areas will contribute to a significant demand for the ICF in walls and roof applications. Key features such as energy efficiency and sound mitigation provided by the ICF strike a chord with homeowners at every income level, directly affecting its popularity as a building system. For instance, as per the recent study conducted by the Portland Cement Association (PCA), the ICF systems will contribute to over 18 percent of all single-family housing constructions across the U.S. by the year 2026. In addition, a significant development in the structural attachments, coatings, and architectural finishes that provide excellent strength will provide new opportunities for the penetration of ICF systems in both tropical and subtropical climate environments. Migration of rural population to the urban areas along with the conversion of major towns into the cities will increase the demand for new construction projects across the developing economies. For instance, as per the Human Development Report published by the United Nations Development Program, the overall Asia Pacific population is forecasted to reach over 4 billion by 2050, of which 64% will be urban population. Furthermore, a positive shift in the consumer living standards will foster significant demand for energy efficient, highly durable, and improved comfort, thus proliferating the product portfolio. Favorable governments initiatives for spreading awareness and providing subsidies for usage of green materials in the construction sector will result in escalating demand for the product. Significant developments in the regulations upgrading mandatory thickness requirements in the building and the adoption of energy efficiency norms have further fueled the demand for insulated concrete form materials. However, fluctuating raw material prices along with major capital investments may hamper the overall market price trend. Global insulated concrete form market from polystyrene foam is projected to surpass USD 1 billion up to 2025. Polystyrene foam generally consists of 95 to 98 percent air concentration. A majority of ICFs are developed using polystyrene material, mainly XPS or EPS. Key properties such as lightweight, high rigidity, effective impact resistance, high thermal insulation, and easy recyclability will provide a strong outlook for the business growth. Furthermore, numerous product applications including floors, walls, industrial cold storage facilities, refrigerators, and freezers will boost the overall industry landscape. Polyurethane foam is anticipated to witness a growth of over 5.5% in terms of revenue up to 2025. Polyurethane has a higher R-value as compared to XPS and EPS as it is manufactured by the integration of isocyanate with a polyol blend. Increasing utilization of the material for walls, roofing, and ceiling, metal-faced sandwich panels, foam sealants, and window frame insulation will influence the overall insulated concrete form market growth. It is most commonly used in building types where insulation and air-tightness are combined with a need for weight & space optimization. 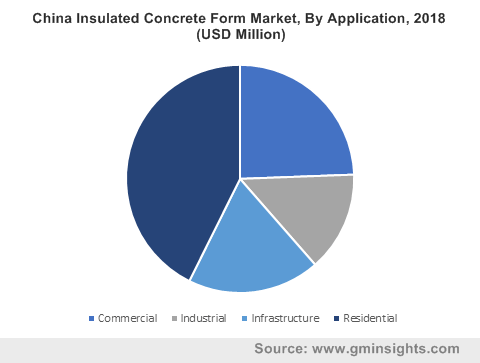 Residential application accounted for over 50% share in the overall insulated concrete form market in 2018. Growing population in several developing nations such as India, China, and Indonesia are anticipated to propel the residential construction, thus providing strong business outlook for manufacturers. In addition, shifting consumer trends towards the construction of houses that provide excellent energy efficiency, improved safety and comfort will further escalate the industry growth. Infrastructure application will observe significant gains at over 6% in the insulated concrete form market up to 2025. Increasing government policies promoting the usage of eco-friendly materials driving the insulated concrete form market. As per the industry estimates, the government spending on the infrastructure in the Asia Pacific region is expected to reach USD 5.36 trillion by 2025, registering a CAGR of 6%. Furthermore, growing demand for the green & sustainable buildings due to the increased carbon footprint across the globe providing a strong outlook for the industry participants. 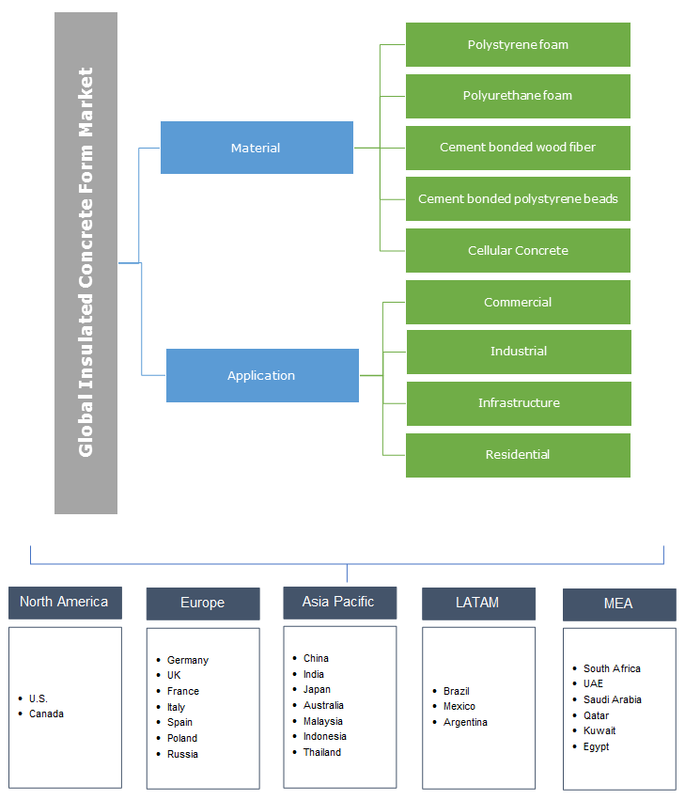 North America insulated concrete form market is projected to surpass USD 650 million up to 2025. Rising concerns of the homebuyers pertaining to the issues such as energy costs have propelled major builders for reconsidering the energy-efficiency of building materials which in return will boost the business share. In addition, increasing adoption of greater energy efficiency offered by the ICFs and pre-formed blocks and panels by the major manufacturers will further drive the industry growth across the region. Asia Pacific will witness significant growth at over 8% in terms of revenue of the overall insulated concrete form industry share in 2018. Increasing infrastructure expenditure in the developing economies such as India, Malaysia, and Indonesia owing to the growing population & urbanization will proliferate the business growth. Besides, significant enhancements in the government regulations regarding the demand for energy efficiency, need to reduce construction time, and safety will further stimulate the industry size in the region. Global business share is highly competitive owing to the presence of dominating players such as BASF, IntegraSpec, Quad-Lock Building Systems Ltd., Airlite (Fox Blocks), Superform Products Ltd., and Nudura Corporation. The other notable industry participants include Amvic, Logix Insulated Concrete Forms Ltd., Plasti-Fab, and BuildBlock Building Systems, Durisol, and Future Foam Inc. Product enhancements, supply chain agreements, and mergers & acquisitions are among the key strategies adopted by major industry players. For instance, in December 2017, Buildblock announced to open a new manufacturing facility in the U.S. to meet the growing consumer demand for the product across the region.